In early March , Steve Ballmer took a shot at rival Google by telling Stanford students the company was a “one trick pony”; that search advertising was the only venture they knew how to make money at. It’s a charge that’s been leveled at Googlers more than once. Whether it proves true or not in the long term, there’s nothing wrong with being a specialist. A one trick pony can make for a great business; a multi-billion dollar one in Google’s case. On the other hand, if you’re going to be a one trick pony, operating in a market with a questionable long term future can pose a serious problem once growth plateaus. That’s the issue Blockbuster’s CEO Jim Keyes faced when he came on board to run the movie rental shop last year. Not only had the company suffered from mismanagement and corporate bloat in prior years, but it was also facing serious competition (both direct and indirect assaults) over a changing market. Netflix, and the convenience of their mail order business, was the head on fighter. Smaller, and more nimble, they were poking at Blockbuster’s core. Beyond them, there were (and are) a host of indirect threats posed by changing consumer entertainment options: cable and satellite TV, DVRs, gaming, even short form amusements like those offered on YouTube, to name just a few. There’s also the increasing promise of Internet distribution to consider. Maybe not two years from now, maybe not even five, but eventually, consumers will hop from DVDs, past Blu Ray, and on to some form of direct, on-demand service. The leadership at Blockbuster knows the challenges they face. They know they have to fight with today’s competition to stay relevant, but beyond, into the future, they also have to prepare for a world where DVD rentals phase out. It is a battle for share in the broader spectrum of entertainment dollars and leisure time. Worse, it pushes Blockbuster toward the unfamiliar terrain of technology development. Building for a downloadable future hardly matches the retailer’s core competencies. Now, the science projects are getting more extreme. One beaker is home to an in-store coffee shop. In another test tube customers can sit at a fountain to get a milkshake before picking up a movie. Imagine a movie rental store with free WiFi or stores with unusual hours. Imagine a Blockbuster store with a kids play area or giant displays emphasizing Sony’s PS3. These things and more, are in development in part of a “throw something at the wall and see what sticks” focus group. According to an article in the Dallas Morning News, 12 stores in Blockbuster’s Dallas backyard have been getting the makeovers. There’s been no marketing or promotion, but it’s been going on since February. He also said this effort was independent from the proposed acquisition of Circuit City. You have to applaud the company for trying. They know they are facing challenges, it’s clear they aren’t sure what the best solutions are, so they’re trying them all. On the other hand, it’s odd to see what amounts to a focus group on Blockbusters hybridized retail plan being run at the same time, or after, their acquisition offer for Circuit City was made public. The old adage is “try before you buy.” Usually, one waits to see what worked before betting the bank on it. The famed management consultant Peter Drucker used to say “the best way to predict the future is to create it.” He also once said, “management by objective only works if you first know your objectives [and] ninety percent of the time, you don’t.” I wonder which Drucker-ism will suit Blockbuster and their efforts to reinvent themselves. So far it seems too close to call. 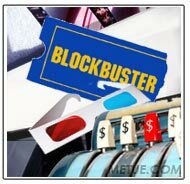 •Blockbuster to rewire Circuit City? •Blockbuster Looking at Download Service? •Down Economy Boosts Netflix, maybe Blockbuster too?